The body of the stein is a smooth, black and blue glazed, high quality stoneware decorated with a gold wrap around design. This stein has been crafted to highlight the different representations of the American eagle over time and to recognize this inspiring symbol of freedom as an important piece of the United States' history and future. A pewter emblem with gold highlighting is situated at the center of the wrap around decoration featuring The Great Seal Eagle and The Shield of 1885. The seal pictures an eagle grasping an olive branch with one set of talons and thirteen arrows with the other. A shield with thirteen stripes rests in front of the chest of the eagle and a cluster of thirteen stars surrounded by sunrays stretching to a circle of clouds is displayed above the eagle's head. In its beak the eagle holds a ribbon with the words, E PLURIBUS UNUM. Rows of raised stars decorate the ornamental pewter lid and a detailed pewter figurine of an eagle, wings spread, sits perched on top of the pewter lid. 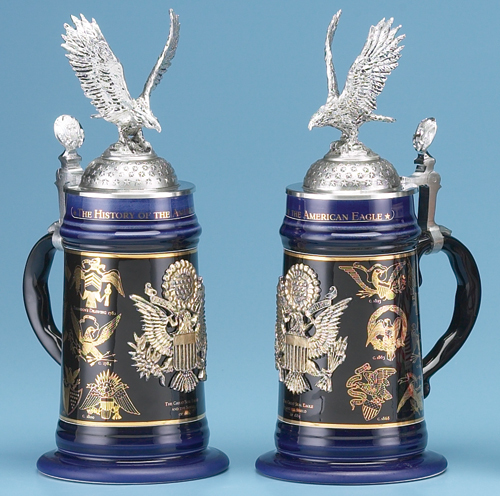 A pewter eagle crest serves as the thumblift for this noble stein. Limited Edition of 5,000 pieces worldwide.